Taiwanese President Tsai Ing-wen called on China Wednesday not to be a "source of conflict" and pledged to boost the island's defenses against Beijing's military threats. In a National Day address, Tsai said the best way to defend Taiwan was to "make it indispensable and irreplaceable to the world," while remaining nonconfrontational in its attitude toward China. "So once again, I am calling on the authorities in Beijing, as a responsible major power, to play a positive role in the region and the world, instead of being a source of conflict," Tsai told an audience of government officials, members of the public and foreign dignitaries gathered in front of the Presidential Office Building in the center of the capital, Taipei. China cut off contact with Tsai's government shortly after her inauguration in 2016 and has been ratcheting up diplomatic, economic and military pressure on Taiwan in a bid to compel her to agree to Beijing's insistence that the self-governing island democracy is a part of China. Tsai also said Wednesday that Taiwan would upgrade its security by increasing the defense budget annually and further developing domestic defense industries, particularly the manufacturing of submarines and training aircraft. 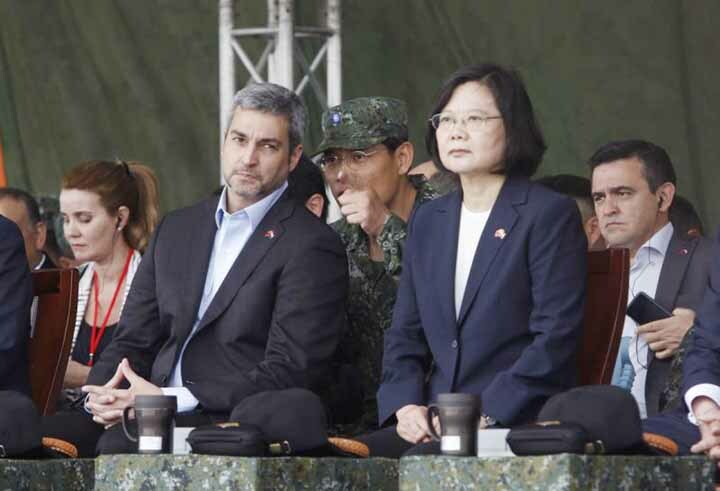 "Our lean and combat-ready troops absolutely have the ability to defend Taiwan's sovereignty," Tsai said. She said she would neither approach conflict nor sacrifice Taiwan's autonomy, adding that the island's military spending will "grow steadily" every year. The president's comments, though consistent with her stance of the past two years, come as China steps up pressure and the United States shows more support for Taiwan alongside a widening Sino-U.S. trade dispute. "The environment, the external world has changed," said Lin Chong-pin, a retired strategic studies professor in Taiwan. "In a way, she is reacting to what Beijing is doing to Taiwan, and I don't blame her." China has flown military aircraft near Taiwan at least a dozen times since 2015 and has persuaded five diplomatic allies to switch allegiance during Tsai's presidency. Today just 17 countries recognize Taiwan compared to the more than 170 that recognize China. Beijing commands the world's third strongest armed forces, including missiles aimed at Taiwan and an increasingly powerful navy and air force. This year China announced an 8.1 percent defense budget increase. China also brought economic pressure by pulling back on tourism to the island, which is 160 kilometers (100 miles) away at its nearest point. "Diplomatic pressure, social infiltration and economic security are all potential threats," Tsai said Wednesday. "Our current priority is to formulate an overall strategy, and bolster our national security." Strengthening the economy and social security are also key priorities, she said. Taiwan raised its 2018 forecast to 2.68 percent in June partly due to inflows of foreign investment. Taiwan is getting more favorable attention from its staunchest informal ally the United States, Tsai added. President Donald Trump's administration has approved two Taiwan arms packages, allowed the first step in submarine technology sales and signed a bill that encourages high-level visits. Under Tsai's Nationalist Party predecessor, Ma Ying-jeou, Taiwan and China signed a series of agreements promoting trade and tourism, while sidestepping political issues. China insists that was possible because Ma endorsed Beijing's "one-China principle," something Tsai has declined to do.